“Utah’s West Desert” is a glimpse into a very unique landscape and an exciting exploration of the many added West Desert climbing routes and new areas to climb. Climbing legend Fred Beckey writes in the foreword of Utah’s West Desert that the area is a fraction of a vast Basin and Range landscape, a span of nearly parallel uplifts and down-dropped valleys that extend from the Wasatch Range to the Sierra Nevada. Massive tectonic forces, too long ago for mankind to comprehend, have extended this landscape into these very unique and similar uplifts making an ideal playground for beginners to cutting edge rock climbers. But what’s more to enjoy and discover beyond this awe-inspiring treasure? Author James Garrett will take readers on an informative and exciting journey and adventure to this amazing spot through his rock climbing guidebook, Utah’s West Desert. 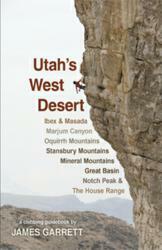 This book provides readers with many added West Desert climbing routes and “new” areas as well. This is sure to inspire both climbers already active and for the first time visitors to the West Desert. This guidebook presents the route details and documentations to guide them in for further exploration and rock climbing trips. Though this book encourages readers to consider their own methods and motives when it comes to climbing and exploration of the West Desert, it provides clear and detailed images and maps along with its complete details to help readers make their West Desert challenge a very memorable and fulfilling experience. Utah’s West Desert not only provides insights and awareness to its readers, it also includes information on the gear / equipment needed, ethics, geology, as well as a historical perspective to the routes and areas. With this book, readers will find the West Desert of Utah a serene, special, and strangely beautiful place that will make them desire to climb and visit again and again. For more information on this book, interested parties may call AtlasBooks at 1-800-BOOKLOG (266-5564) or email at order(at)atlasbooks(dot)com. Having climbed in more than 70 countries throughout the world, James Garrett cherishes most the climbing he finds in Utah’s West Desert. Since his first climbs here in the 1980s, this unique region has remained the focal point for his rock climbing and route development passion. Living in Utah for 30 years has allowed James the opportunity for innumerous brief and extended visits to the many diverse rock and mountain climbs spread about the West Desert. He authored the first climbing guidebook to this area, Ibex And Selected Climbs Of Utah’s West Desert (2001).